Worden Discussion Forum » Customer Training & Support » Ask a Trainer - TC2000 version 7 » v7 Download? I haven't looked at v7 in years. Couldn't find it under the Products pull-down menu on the home page. Do you have a link where I can download it? There was a link in the response where I mentioned it was still available (but it won't run without DJ data). Obviously time to switch to decaf. I'm a little confused. What-the-fudge is "Dow Jones delayed data"? The only thing I see is the $1/month delayed Dow Jones Indexes & Watchlists. I got that AmiBroker code from Larry Connors, and I wanted to take a crack at exporting the data from v7 and feeding to AmiBroker v6.2. Version 7 now requires that you subscribe to either delayed or real-time Dow Jones index data. Dow Jones increased their pricing last year and we had to start charging for it. 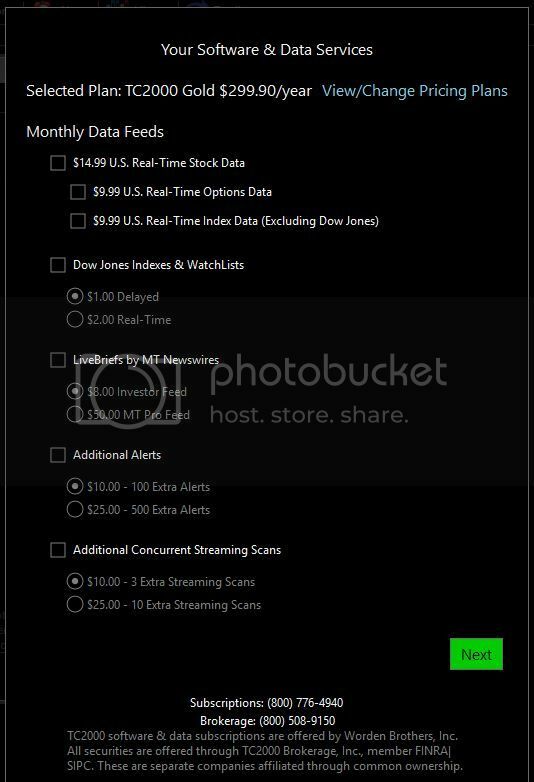 Unfortunately in the version 7 program we don't have the option of a la carting the data feeds so everyone using version 7 has to subscribe to the Dow Jones indexes (delayed or real-time) in order to run the software. That's kind of what I thought, but I was just confused how subscribing to "index data" would get me access to "stock data". But if that's all it takes, that's fine. I can scrounge up a buck somewhere. lol. I should be ready next week to start playing around with downloading v7, exporting its daily data, and importing that data into AmiBroker. Are we talking $29.99 monthly for Gold, and $1.00 monthly for Dow Jones Delayed Indexes & Watchlists? Any other fees I need to be aware of? Those should be the only fees required to do what you want with TC2000 v7. I cannot think of any other required costs. I developed scans for that friend I converted to TC2000, and will still use v18 daily. But I also have Larry Connors' AmiBroker Add-On code for his latest book, so v7 will come in handy as a data feed. Why settle for one yacht, when you can have two? From my own personal experience, I generally think you are better off knowing people with yachts than owning a yacht yourself. Ownership involves significant ongoing expenses and quite a bit of work (unless you hire somebody else to do it). If you don't already know people with yachts, you can usually become a member of a yacht club or country club with docks without even owning a boat (and it is almost always less expensive than having dock or moorage priviledges). Other members are usually quite friendly and generous when it comes to taking you out as a big part of being a member is socializing with other members. If you become close enough, seem trustworthy, and demonstrate adequate proficiency, it isn't even out of the question that other members will allow you to go out on your own. That said, if you are willing to live a fairly minimalist and slightly exotic lifetlyle, you can probably afford to own a relatively small yacht even before hitting it big. All you need to do is live on the yacht. Proximity to a clubhouse (and maybe even a golf course and tennis courts) can go a long way towards mitigating the sacrificed luxury and square footage of your living quarters and give you a place to entertain more guests. As long as you are in a place where you can do this year round (and a slip with a bubbler can allow this in fairly northern climates even on rivers and lakes), the costs can be comparable to living in a fairly small but decent house, condo, or apartment (assuming you ditch said house, condo, or apartment to cover the yacht and marina costs). When compared to waterfront property, it is most likely less expensive.